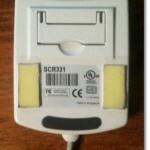 I have been doing some reorganizing lately, and I ran across a “broken” Smart Card reader. So I began to look deeper into this “broken” SCR, and see what the deal was. 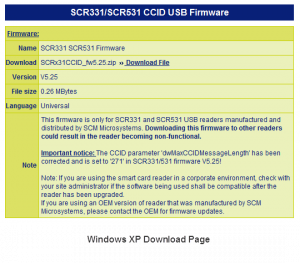 It is a SCM Microsystems SCR331. I chose the appropriate download (for Windows 7 x64) to get started. So I’ve got the drivers… I must be good to go. Well, I connected the SCR to my system, pointed to the drivers, and voila! Maybe this darn thing is broken. Maybe Windows 7/Vista just can’t use it. So I fired up a Windows XP VM, loaded the drivers and voila! It worked. Alright, something is a little strange here. Then I noticed something… Looking at the downloads page for Windows 7 x64 and Windows XP I noticed something very different between the two. So… There is a firmware update for the device. Good to know. Maybe that’s the fix. I figured that this wouldn’t work in Windows 7 x64, but what the heck, the SCR was “broken” anyway. Upon downloading and extracting the .zip file, I ran the included FwUpdate.exe to begin the upgrade process. Surprisingly, no compatibility issues, and it ran without issue. 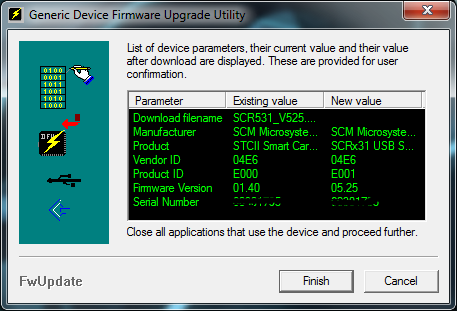 My firmware was at version 1.40, and this package 5.25. Afterward, the SCR was fully patched to 5.25. I added the appropriate drivers to Windows 7 x64, and voila! It worked. I know that these devices are not that expensive, a Google Shopping search lists them around $15 each. I can only imagine how many of these have been discarded by various entities, because they “didn’t work” with Windows Vista/7. So it would cost an organization with 100 of these, about $1500 to replace them with a similar “supported” device if the prices were comparable. In short, before something is discarded, be 100% certain is isn’t going to work. It could cost you in the long run. Now maybe I can see if I can get it to work with VMware View… I guess I’ll start with Jason Langone’s post: How to Configure VMware View 4.5 with US Department of Defense CAC Authentication. Do you still have the software for the SCR331? I am having problems getting my SCR331 to work in windows. I no longer have a need for the SCR331, so I don’t. The site was updated, but the last time I looked, I was able to find it with some digging. I’ll see if I can find it and let you know. I troubleshot this for a long time 3 hours to be exact. Didn’t want to scrap my old reader. Anyways, the site is now http://support.identive-group.com/dfu_fw.php?lang=en . They don’t tell you a whole lot and wont make it specific about scr-331. I used trial and error. 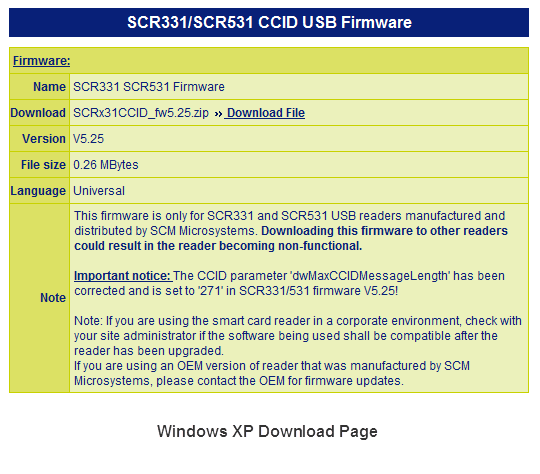 The firmware update for SCR3340 ExpressCard54 SmartCard V5.25 worked for me. Hope this helps. I just used this info. 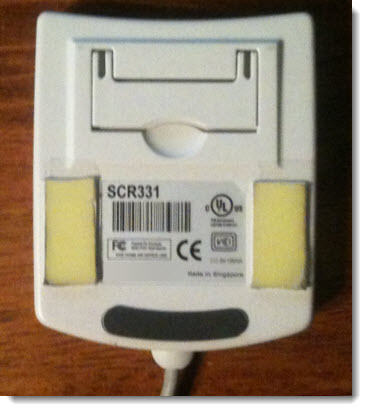 It saved 30+ of these smartcard readers from the dump. Thanks for posting it Jase and Mitchell! Under devices it does show that the “USB smart car reader” is installed though. Unfortunately I haven’t had to do this/tried this in several years. If your using a Vbox, you have to go to the menu for your host MAC OS and select devices and then USB and the SCM card reader. 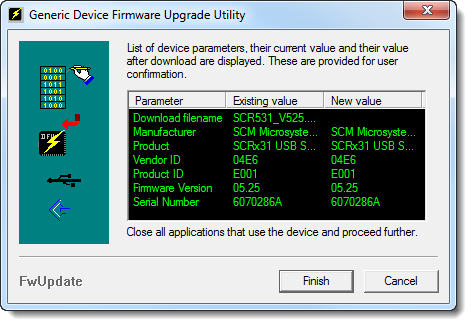 then on the XP guest OS, after the firmware upgrade enters DFU mode it’s waiting for you to select kind-of the same devices then USB and SCM card reader DFU mode, not the regular SCM card reader in the same menu. after that I had firmware the updated firmware 5.25. then I had to select again the regular SCM card reader. unless you want to use it on the host mac, then just shutdown the XP Guest OS.